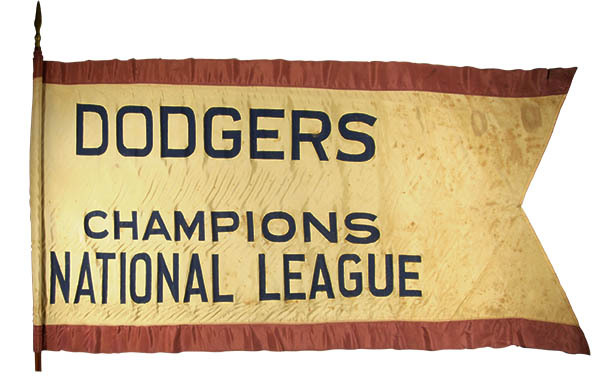 Here is a second helping of Dodgers' related memorabilia available for sale at Hunt's current Live Auction at the Louisville Slugger Museum and Factory. Yesterday, I shared pics of some vintage advertising pieces. Originates from a descendant of the original recipient whom relates that it was obtained by her father, from an Ebbets Field grounds crew member, following the 1955 World Series. It would look so great on my wall. Unfortunately, the $7,500 to $10,000 estimated value far exceeds what I can dish out. 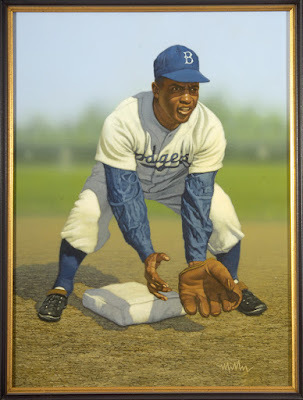 The next three items below all relate to Jackie Robinson. First, check out a 1954 Jackie Robinson "Major League All-Stars Barnstorming Tour" program, and it's been signed by Jackie in one of the inside pages. 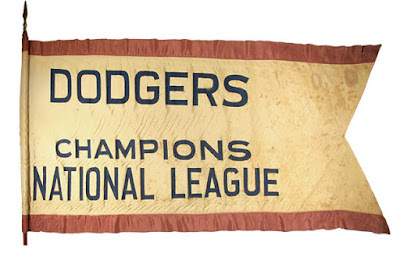 And here is a Jackie Robinson All-Stars barnstorming team souvenir pennant. It is unclear if this is an companion piece to the above program, but you have to think they were once sold side-by-side. To finish off this post, below is an original painting of Jackie Robinson by Arthur K. Miller. As you may know, Miller's work has graced the cover of numerous magazines and has been an consistent presence at NSCC for many years. He's even had his work distributed by the Baseball Hall of Fame. Go here to check out his website. I can't wait for Spring. It's a time for hope and optimism. All that had happened the season before is like water under the bridge, and you can be sure that something new will emerge. This coming March we'll have a whole new cast of characters manning the dugout, giving orders and navigating the seas. And you can be assured that there will be plenty of changes on the bench, as well. What will transpire over the coming months is sure to be a surprise, so I'll just sit back and watch, pontificate and hope for Spring. 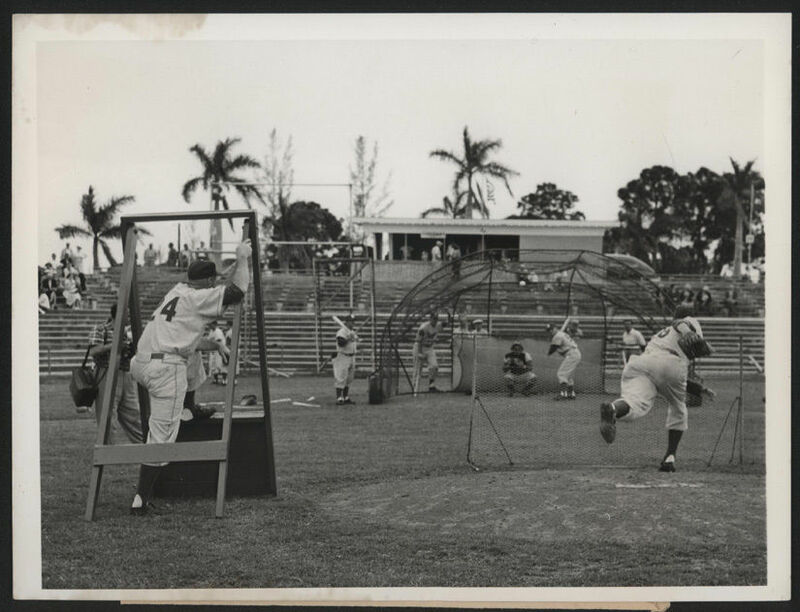 The International News press photo above, dated Feb 27, 1957, is of an early spring training practice session at Dodgertown in Vero Beach. Walter Alston is seen watching intently from the field behind a protective cage. I found this pic on eBay. You can check out the auction here. Check out this fantastic charity sale being put together by AM570 in support of the 2015 Paralyzed Veterans of America Radiothon. It includes once in a lifetime experiences with the Dodgers. You can be a Dodger for a day, get a suite, throw out the first pitch, interview Adrian Gonzalez, take batting practice, etc. In case you're interested, the Dodgers AA club Tulsa Drillers have finalized their schedule for the 2016 season. Check it out here. Both Zach Greinke and Adrian Gonzalez are finalist for Rawlings Gold Glove Awards this season. Check out the finalist list here. Programming and content costs, which increased $135 million, or 10.2% year-over-year, continued to be the biggest drag on adjusted OIBDA. As in Q2, contractual affiliate fee increases of roughly $100 million and a contractual increase of around $30 million in Dodgers' rights fees were the two biggest components of the increase. So, at least the Dodgers are getting paid. Mark Saxon at ESPN writes about another Dodgers managerial candidate - Bob Geren. Matt Borelli at Dodger Blue writes about another Dodgers managerial candidate - Dave Martinez. Via Matt Miro at Baseball Magazine, "Remembering Eiji Sawamura: A Celebrated Life of Sacrifice." 17-year old Eiji Sawamura was widely considered the best high school ballplayer in Japan’s new and budding baseball culture. When he was asked to take part in the exhibition series it meant being expelled from high school and forfeiting the chance to pitch in college. But Sawamura saw it as a great opportunity to represent his country and gave up a future education for the chance to take on the best players in the world. The young righty hurler took the mound against Earl Whitehill and the two became locked in a pitchers’ duel that is still talked about today. Sawamura would steal the show despite ultimately losing the game. That’s not surprising considering he struck out Charlie Gehringer, Ruth, Gehrig and Foxx in succession, a stunning feat comparable only to Carl Hubbell’s performance in the 1934 All-Star Game and, later, Pedro Martinez in the 1999 All-Star Game.